Talk to me, Mamas. Are you currently living your dream? Are you working for your dream company or pursuing your dream career? If you’re reading this post, I have to assume the answer is “no.” Scratch that. The answer is “Not yet.” Your future pursuing your dream job starts today. Let’s start with how to identify your dream job. I want you to think big. Don’t think practical – think ideal. Where do you want to be? Whom do you want to be? Think about the kind of work that would make you jump out of bed each morning because you get to do your job – you aren’t just required to anymore! What do you enjoy? What gets you excited? Do you want to manage people? Are you sure? Have you thought about the reality of managing people? It’s not just the fun parts of inspiring your direct reports and seeing the fruits of their labors. It’s managing schedules, addressing conflict, and having difficult conversations. If that is your dream job, by all means, pursue it! My point is to think of your dream job from every angle. Prior to pursuing the job of your dreams, I want you to be sure it is, in fact, the stuff that dreams are made of. Now, tell me the kind of company you respect. Is it public or private? Nonprofit? Large or small? Think about what makes a company admirable to you. Or would you rather work for yourself? Being your own boss requires a firm grasp on your schedule and a boatload of self-control. Creating a business requires a great deal of time and commitment, so make sure that fits into your dream job description. If your dream job is building your own empire, that’s amazing. We’ll talk more about being a mompreneur as we grow our blog (Ayo! Shoutout to the 2 mompreneurs running Kandy Apple Mama! ), but this article will focus on the jobs that report to others and go through a formal interview process. If this is your first job, look for a company that’s stable and growing and one that offers great benefits (401K matching, health and dental insurance, life insurance, paid vacation, and maternity leave). It’s great to aim high, but also be realistic about what is achievable with minimum experience. Many companies want a degree with younger applicants these days. So if you don’t have one, make sure you are prepared to discuss relevant skills or experience. If you do have a degree, make sure you’re prepared to discuss relevant classes and skills you learned in college. Step 2: Focus on the Job Description. Did you decide on a job?? Great! Now it’s time to actually find it in the real world. (This may take some digging.) Google may be your best friend in this situation, but I highly recommend job searching on Indeed.com, Glassdoor.com, and FlexJobs. Indeed has tons of recent job listings. Glassdoor shares job listings, potential salary info based on current and previous employee salaries, company reviews, and more. FlexJobs is chock full of jobs from all over the country that you can do remotely from your home – from content writers, to virtual assistants and everything in between. It is a paid service to view and apply for all the jobs (there are tons!) but that’s because they screen every listing before they allow it to go public on their site; you can be sure that every job posting is legit! Once you’ve found the job, first – celebrate! Woohoo, Mama! I am so excited for you! I cannot wait to see you sign that offer letter for your dream job! Once you’ve found your dream job posting, I want you to read the job description three to five times. No, seriously. Read it at least three times. Did you know that employers give you the steps to take to actually become the perfect candidate for a position? The third time that you read the job description, I want you to highlight the important words you read. These are the key skills, competencies, or duties of your dream job (AKA, the golden ticket). This is your how-to! Now that you’ve highlighted key words or phrases throughout the job description, you know exactly whom you need to be on interview day (and in your future career, boss lady!). Before you make any edits to your résumé, I want you to take a look at it. Does it look interesting? Is it current? Would you be interested in hiring a candidate who handed you that resume in your hands? If the answer to any of those questions is no, we have some work to do! It will be worth it. Just keep thinking: Dream Job. First, let’s get that résumé current and modern. I highly recommend this résumé template that Amanda created just for our Stepmomming fam! Subscribe to Get Your FREE Resume Template! Exclusive for Stepmomming subscribers, a collection of job interview prep materials sent directly to your inbox! In fact, when you subscribe, you’ll get access to ALL of our freebies! It’s fresh and eye-catching! I love everything about it! Next step: you need to update your résumé! Make sure all relevant experience is included! Is your latest job, community service event, or certification listed? Keep things up-to-date, too. If you’re 30 now, you may want to rethink adding in all your high school achievements other than diploma info. Is your volunteer experience relevant if your most recent activity was 10+ years ago? Maybe not. Make it specific to the job! Now that all of the information is current, let’s get the résumé ready for THIS job. You know, your dream job. I want you to review the list of highlighted words from the job description and include them every chance you get on your résumé. Don’t be obnoxious about it and include a single word 20 times, but if you have 3 examples for how you have prepared P&L documents, include them! The purpose of this exercise is to hammer in the point that you are perfect for this job. Once you think you’re finally done with the résumé, I want you to reread it in full. Does it look good? Great! Walk away for 5+ minutes then come back and reread it again. Does it still look good? Even better! 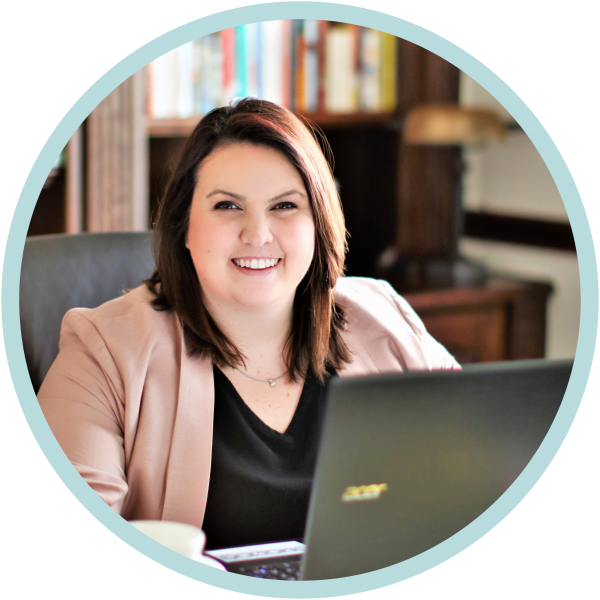 Final check, I want you to have one other person (your hubby, your mentor, or perhaps your favorite mom blog duo – just make sure it’s someone you trust!) read it. Make sure you’re not blind to that typo on bullet point 5, the missed tense change on bullet point 3, or the font size change on your 2nd reference. There are so many things you can do to prepare for the interview! I want you to prepare enough to be confident in and excited about the position, but not so much that you go into information overload and shut down. Got it? Check out the company’s website and review recent news articles about the company. A simple Google search should you help you locate these resources. Have there been any recent acquisitions or mergers? Have they gone public in the last year? Can you speak to any recent board or executive team changes? Great! If the company is public, I want you to also review their recent stock trends. This is a great talking point in an interview. I promise you that your interviewer will be impressed if you can speak knowledgeably about the company’s stock trends and/or recent news and . Do your research! It will pay off. Don’t kill the messenger, guys, but I really want you to read the job description again. Develop at least two examples of how you have mastered the highlighted words. Have you performed those tasks in the past? What are similar projects you’ve led? Write out each of the highlighted words and your 2+ examples for each. Next, I want you to use the job description to truly imagine what the job looks like. A well-written job description should help you picture a typical day in the position. If you imagine the job and it still aligns with your expectations, I want you to convey to the interviewer that this is your dream job, you can literally picture yourself in this position, and these are the kinds of tasks that you enjoy doing. Think up your big three. These are three points that you absolutely have to tell the interviewer! Perhaps it’s the big project you spearheaded that saved your last company $1B, or maybe it’s that you admire this company so much that you chose to do your final college project analyzing their financials and not only learned a lot but identified areas of opportunity. SHARE THESE. These are what sets you apart! Think long and hard about your big three. Perhaps you have a list of 10? Find a way to narrow it down. If conversation allows, you’ll be able to talk about the other 7 in the interview. There are 3 you absolutely have to share though, so write them down and don’t forget them. Find a way to make sure you talk about them in the interview–even if it’s waiting until the end of the interview when the interviewer asks if there’s anything else he should know about you. Make sure to bring extra copies of your resume! I also want you to prepare any other documents and/or representative examples of your work to bring to the interview. It could be presentations you’ve put together in the past, graphic design work, or reference letters. Anything that could contribute to your suggestion that you are the absolute best fit for the job. I heard rumors that the hiring manager for my latest interview didn’t want to hire someone for the job that didn’t have direct CPG sales experience. Well, I certainly didn’t have that. BUT, I have had customer-facing roles before, so I printed off half a dozen emails from my days in Customer Service from some of our larger customers (bottlers he would recognize) that expressed disappointment I was moving to a new department and extreme gratitude for a job well done with their accounts. The hiring manager loved that I had the foresight to bring them with me to the interview and graciously accepted to take them with him to review after our interview. 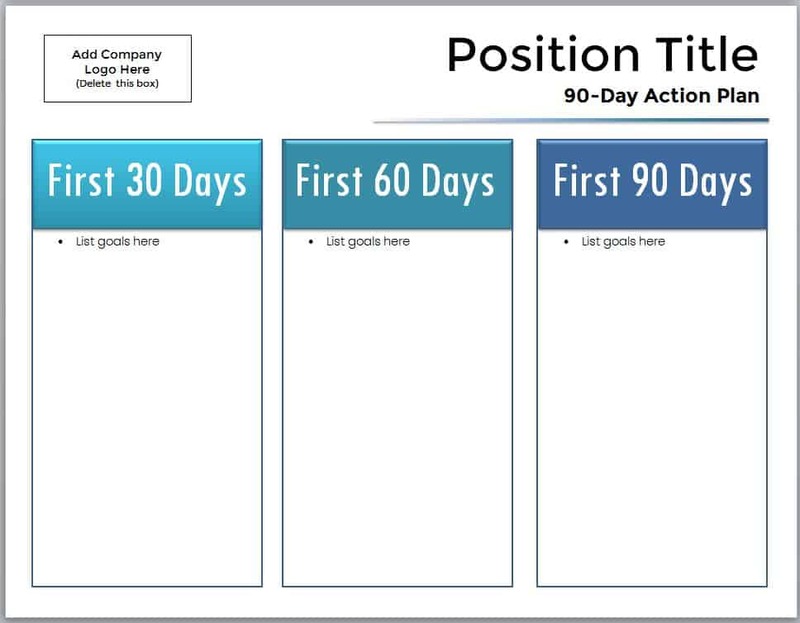 If you’re applying for a managerial or above role, I want you to also prepare a 90-day action plan. No worries, I’ve provided a template for you. All you need to do is add the company’s logo and your 30, 60, and 90 day plans. Subscribe to Get Your FREE 30-60-90 Day Action Plan! 30: Gain in-depth understanding of company strategy for my assigned marketing brands. 60: Understand historic inhibitors to growth and develop counteraction plan. 90: Delve deeper into opportunities for competitive growth advantage. What did this prove to the hiring manager? I want to use the company’s prioritized strategy! I understand that growth rates haven’t reached expectations and want to understand why and do something about it, right away. Finally, I know the company is prioritizing competitive growth advantage this year, and I’m going to explore opportunities to assist with that mission in this role within my 3rd month on the job. Step 6: Ace that Interview! This one is important, so if you disregard everything else I say in this post, I want you to listen to this one. You have to picture yourself being offered the position. If it’s your dream job, you know you can do it. You know that you’re capable and eager to succeed. I need you to build yourself up and walk into that interview with all of the confidence in the world. When you believe the job is yours, the company will believe it too. If you have to ask yourself if it’s professional enough, it’s not. Not dressing for the job you want? Try again. If you don’t impress yourself when you look in the mirror, keep going. As women, there’s a very difficult balance when it comes to acting professional in a workplace (I highly recommend Nice Girls Don’t Get the Corner Office if you want to learn more). You can wear your hair down or up, whichever you prefer, but do not play with your hair in the interview! Dress in slacks or a nice skirt or dress, but stick with the high school rule that if it your skirt doesn’t make it past your fingertips, it’s not appropriate. Also, don’t wear heels higher than 3 inches! Some of us out there don’t always know what’s popular or trending when it comes to fashion these days. Or, we may have a hard time picking clothes that actually fit our bodies. If you’re like me and need a little help in the fashion department but can’t afford an expensive personal stylist, then I have a suggestion. There is this incredible company called StitchFix that will send you business-appropriate attire (that matches your style preferences and budget!) each month. You share your body measurements and size preferences, and they’ll ship you a box of clothes they believe you’ll love, right to your door. You can try on the clothes and if you like them, keep them! If you don’t like certain items, send them back! You only pay for what you keep! There is a $20 per month fee for the service, but that $20 goes towards whatever item(s) you end up keeping in your box. If you keep all the items, StitchFix gives you a discount on everything. If you need to send anything back, they include a prepaid shipping label so you don’t have to worry about postage. Amanda: I loved using StitchFix! They actually match you up with a stylist who goes through your Pinterest board (that you choose) to determine your style and what you like. Every month they send you a box of items that could make an outfit. It’s not only like having a personal shopper who knows you, but who then sends the items right to your door – just to try on! Sometimes when they send an item I normally would never pick up in the store, I’ll try it on and end up loving it. The clothing can get a little pricey, but if they send anything out of your price range, just send it back. And be sure to let them know. With a company like StitchFix around, there’s no reason you shouldn’t be dressing for success on your interview (and when you get the job!). Make sure to bring your résumé and copies of representative work with you. If you’re a PowerPoint beast, bring some of your old decks with you. If you built an application that reduced process time from a week down to a couple of hours, create a handout that you can distribute in the interview that shows how it works! Make the absolute best case for hiring you as you can. This is your time to shine! At the end of the interview, your interviewer is going to ask if you have any questions. No matter what you do, do not say no. There really is no such thing as a stupid question here. Ask something, anything. Show them you’re interested in the position, the company, the interviewer, etc. What kind of career path does this position allow? Can you please tell me which skills your ideal candidate for this position would possess? What is an example of a project you’ve wanted to complete on this team but haven’t had the time or capacity to pursue yet? This is also the perfect opportunity to ask a question about a company merger, stock growth, acquisition, etc. if you found something interesting in your research. Show the interviewer that you are legitimately interested in the company and position. This is your dream job, remember. It’s worth fighting for. Finally, I want you to ask for the job. In my last interview, the interviewer even thanked me for asking the job. I don’t care how you ask for it – “I look forward to working for you,” “And that’s exactly why you should hire me!,” or “I know that I would be an incredible asset to your team because of x, y, and z, as we’ve discussed. And with that being said, I’d like to request to be hired for this position.” The important part is that you’re taking initiative and being proactive about asking for what you want. Always, always, always send a thank you note the day following your interview. I don’t care if it’s a handwritten note on personal stationery, an email, or a postcard – just send a thank you! Sample text is below, but make sure to personalize it to fit your writing style and YOUR interview! Thank you so much for your time and consideration of my application for the Senior Analyst position open on your team. It was a pleasure meeting you yesterday. My prior experiences have definitely prepared me for this role, and I am eager to get started! 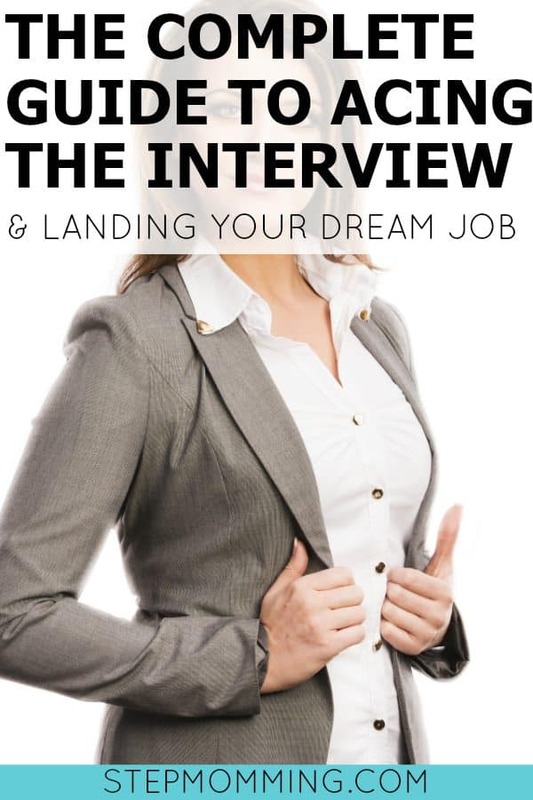 Looking at these 7 steps for Landing your dream job, things might seem a bit overwhelming. Identifying the job you dream of, finding a job posting that matches, focusing on the job description, updating your résumé, preparing pre-interview work, acing the interview itself, then following up after… it’s a lot! But don’t let it intimidate you. This is your dream job, and anything worth having is worth fighting for. So put on your big girl pants, and take this advice one step at a time. 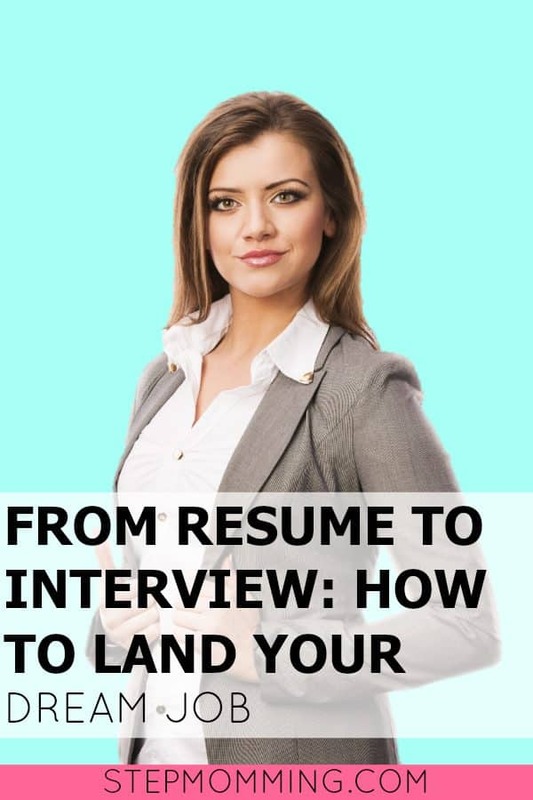 I know when Amanda and I were in High School and College, we both could have benefited from knowing these action steps to getting the jobs we really wanted. But now, we know better! And you do too! You are a rock star, Mama, and I know you deserve this job. You deserve the things you want. It’s your dream job, so FIGHT for it. PS: Want to check out all of the Adulting Series, posts? Check them out here.